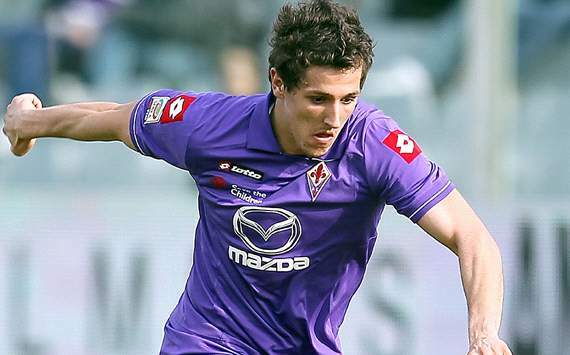 Goal.com has reported that Juventus are ready to trump Chelsea to Fiorentina star Stevan Jovetic by increasing their offer for the attacker to €25 million (£19.5m) after their initial bid was rejected. The Serie A champions are keen to strengthen their strike force ahead of the 2012-13 campaign, and have earmarked the 22-year-old as the perfect addition. The Old Lady, therefore, have made the decision to improve their bid for the forward and they are now ready to pay €25m (£19.5m) for the former Partizan Belgrade youngster. Jovetic has been linked with a move to Chelsea as Roberto Di Matteo seeks to aid striker Fernando Torres by investing a significant portion of his transfer budget in support players, with Eden Hazard and Marko Marin having already signed. AC Milan have also made an enquiry about the Montenegro international's availability, but it seems unlikely that the Rossoneri can match Juve's offer for the player due to the financial uncertainty at the club. If the move to Turin materialises, Jovetic would be Juventus' fifth high-profile signing of the summer transfer window following the arrivals of Sebastian Giovinco, Lucio, Mauricio Isla and Kwadwo Asamoah.